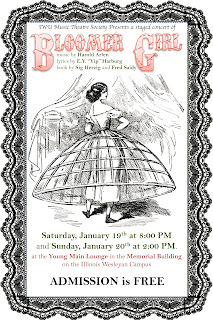 Although Bloomer Girl was revived in 2001 as part of New York's City Center Encores! series, it is not a show that gets produced very much. There are various theories advanced for that. Does it have too many characters and too difficult a costume plot -- with a parade of increasingly large and outlandish hoop skirts -- for regional theaters to stage? Or was it something to do with E. Y. "Yip" Harburg, the unapologetic leftist who wrote the lyrics to Harold Arlen's music for Bloomer Girl, since Harburg was blacklisted for his political views during the Hollywood witchhunt of the 50s and early 60s? 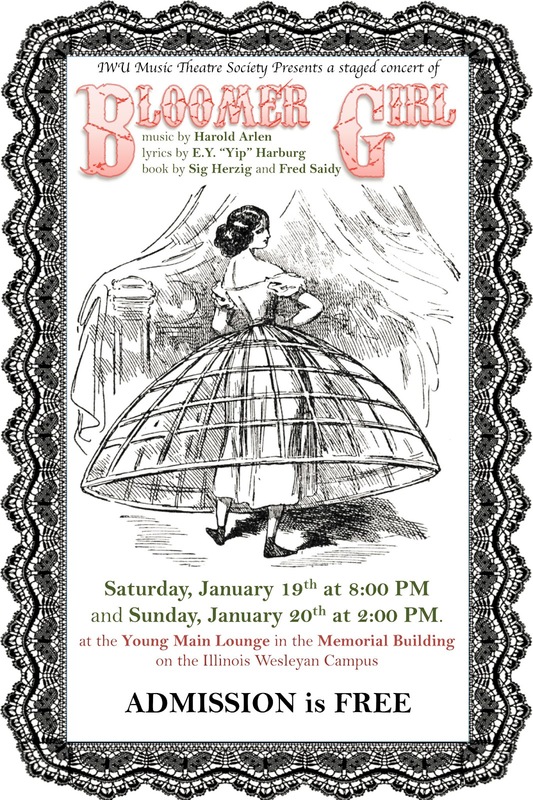 Scott Susong, who directed Bloomer Girl last weekend as a staged concert reading for Illinois Wesleyan University's Music Theatre Society, wanted to revive Bloomer Girl because he felt its messages of equality -- both gender and racial equality -- were as fresh and important as ever. Those views are certainly on display in Bloomer Girl, which involves a young woman named Evalina Applegate, who is the youngest daughter of a prosperous Yankee hoop-skirt manufacturer at a time just before America's Civil War. Our heroine resists both the marriage her father has planned for her, to a handsome slave-owner from Kentucky, and the hoops Dad is peddling. Evalina isn't sure about marriage at all, but especially not to someone who owns a slave, plus she prefers the more practical bloomers (i.e., pants) championed by her suffragette Aunt Dolly in the feminist newspaper she puts out. That sets up three different conflicts: Skirts vs. Pants, Women's Rights vs. Being Controlled by Dad, and Abolition vs. Slavery. You will note that all three issues center on freedom. The fact that this is all played as a musical comedy, complete with a second-act show-within-the-show version of Uncle Tom's Cabin, probably seems strange to 21st century audiences. The sprightly tone of Bloomer Girl is sometimes at odds with its serious message, and the Arlen/Harburg score doesn't contain anything as memorable as "Over the Rainbow" or "Stormy Weather," other Arlen tunes. Still, it's a sweet little show with its heart in the right place, and it deserves to be taken off the "forgotten musicals" list and put back into repertory by theaters who can pull out all the stops with those outrageous hoop skirts. For IWU, director Scott Susong worked with limited choreography (no extended Civil War Ballet) and simple accompaniment (apparently the full orchestrations were lost/gone/not available, so Susong had to go with what he could pull together for piano and percussion) as well as stripped-down costumes (with hoops over leotards and a whole lot of plaid bloomers). For this kind of concert setting, that all worked well, but it would be fun to see the real, full-blown version. Heather Priedhorsky made a lovely and spirited Evalina in this concert staging, while Jordan Lipes was quite charming as her Southern beau, Jefferson Calhoun. I also enjoyed Chloe Bluml and Josh Levinson as Mom and Dad Applegate, Erica Werner as pesky Aunt Dolly, Reggie Cooke as Pompey, the escaped slave, and Patsita Jiratipayabood as Daisy, a housemaid with decided opinions on women and love. Other standouts included Natalie Howard, Halimah Nurullah, Ian Stewart and Kayla White, who combined with Cooke to bring energy and life to "I Got a Song," a folksy second-act anthem to freedom that brought home the show's themes. Music by Harold Arlen, lyrics by E.Y. Harburg, and book by Sig Herzig and Fred Saidy. Cast: Elizabeth Albers, Rosalie Alspach, Kelsey Bearman, Chloe Bluml, Julia Cicchino, Reggie Cooke, Steven Czajkowski, Bucky Emmerling, Evan Dolan, Emily Hanlet, Lydia Hartlaub, Natalie Howard, Patsita Jiratipayabood, Annie Kehler, Josh Levinson, Jordan Lipes, Forrest Loeffler, Chris Long, Carlos Medina, Halimah Nurullah, Heather Priedhorsky, Ian Stewart, Alec Sutton, Kelsey Vonder Haar, Caroline Wagner, Erica Werner, Kayla White and Megan Win. Performances took place January 19 and 20, 2013.